Determining the sequences of single activities within each process is bound to be relatively labor-intensive. This makes it very important to concentrate on the areas which really matter. The detailed activities within the individual processes must be discussed with all relevant parties, in order to include into the design as much experience and knowledge as possible. The Process Owner is responsible for this task. As a result, a consensus must be reached and documented in the form of detailed process flow diagrams (see Fig. 1: ITIL process flows). The framework of process structure and interfaces for this task was set up within the previous project steps: Due to the prior definition of the project interfaces, it is already established upon which inputs a process may build, and which results it must deliver for successive processes. With this information clearly specified it becomes much easier to define a process flow in a simple, straightforward way. Additional information to facilitate the process execution, describing procedures or deliverables in detail, can be added in the form of linked checklists/ document templates. For example there could be a couple of extra pages describing what sort of information is to be collected during the initial registration of an Incident. Process descriptions should give a clear idea of the required activities and their sequential order, but too many details should be avoided. Too much detail usually means that these documents are soon out of date, as they are too bulky to be an effective tool for the Process Owners. It is recommended to confine further details into linked documents (e. g. guidelines and definitions of process outputs). It is decisive for a successful process implementation to include all the relevant parties in this phase of the project, in order to make use of their wide range of experiences from daily business, and to ensure that the redesigned processes will be accepted and adhered to. Being well prepared is essential at this point in order to avoid the risk of producing a large number of uncorrelated and oversized documents. This is why our method of "ITIL Implementation Using ITIL Process Templates" takes great care to set up a framework of process structure and interfaces during the initial project steps. Due to the prior definition of the project interfaces, it is already established upon which inputs a process may build, and which results it must deliver for successive processes. With this information clearly specified it becomes much easier to define a process flow in a simple, straightforward way. 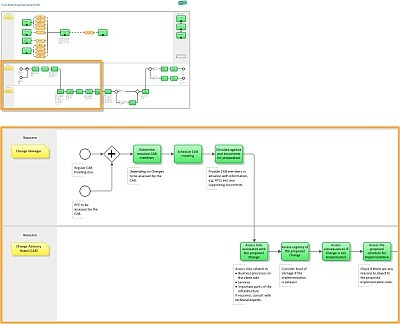 The ITIL Process Map makes detailed process flows available for all ITIL processes (see Fig. 1: ITIL process flows). These models fulfill the requirements of ITIL and ISO 20000. Modifications will often be necessary to allow for special circumstances or preferences; these alterations are of course permitted, as long as the ITIL guiding ideas are followed. As an addition to the detailed ITIL process flows, checklists/ document templates (see Fig. 2) are available within the ITIL Process Map, describing procedures or process outputs in detail where necessary. → "The most sought-after ITIL 2011 templates". 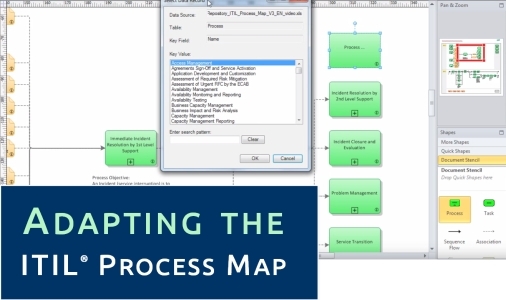 FAQ: ITIL reference processes; IT Process Maps. Structure and contents of an ITIL process model: Video: Introduction - ITIL Process Map; IT Process Maps.